Produced in 5 business days, after proof approval. Add shipping time from Illinois. When will I get my order? : Orders take three weeks to process. Then add ship time . To calculate ship time, please refer to this UPS Ground Shipping MapClick here. Your order ships from Il. Shed a little light on your party with these 3 way Light Up Pilsners! These flashing pilsners are perfect for all your fun filled occasions - adult birthday party, Super Bowl party, summer reunion party, Octoberfest and on! 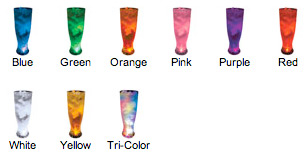 Each light up cup is made of styrene, which is a form of hard plastic - the cups are clear and the color shown in the photo indicates the view of the cup with the light function operating. These personalized pilsners make great party favors for your guests - in a long, tall way! 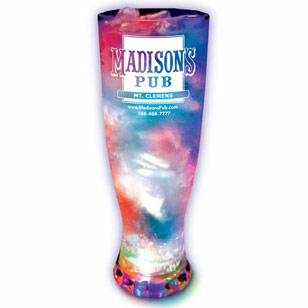 They hold 22 ounces of your favorite beverage and add a mini light show - this clear pilsner is offered in a Tri-color light base featuring red, green and blue LEDs or a one color light base. The light actions are controlled by a push button on the base - push once for random flash, twice for steady blink and a third time for a constant glow. 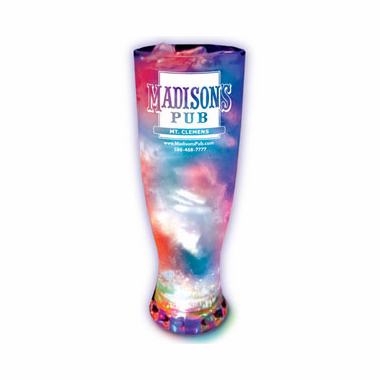 Then personalize these party pilsners even more by selecting the font and imprint color of your choice. 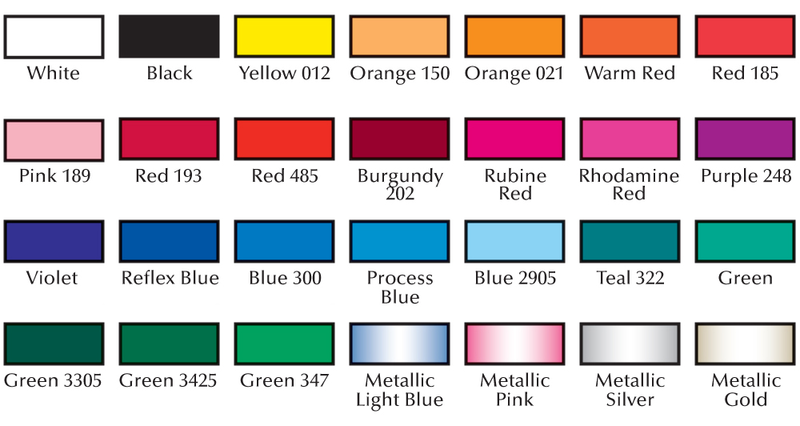 Planning a theme party? 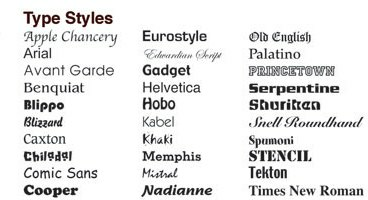 Let us know - our artist can create a design for you! You can order them blank or personalized - everyone loves a personalized party pilsner! The pilsner dimensions are 3.25"W x 9.125"H and it has an imprint area of 3"W x 2.5"H.
Click here to: order a sample of any theme cup. The cost is $5.00 which includes shipping costs. Also - if you would like us to email you a 3-dimensional picture of a cup with your particular design - please email your request to: info@cool-party-favors.com . Your order takes 12 business days to produce. Shipping time is additional and can be calculated using this UPS Ground Shipping map Click here. Your order ships from Il. 3 Way Flashing Mug - 22 oz.